Football players go through “2-a-days” where they have a practise session in the morning and another one in the afternoon. It is a gruelling time of training camp, and leaves most players tired from all the work. The playoffs will bring me to my blogging equivalent. Welcome to Living Up to My Name’s “2-a-weekends” Each weekend, during the playoffs, I will publish a post on Saturday morning before the weekend’s games and one Sunday evening featuring players that will play during the weekend’s games. So grab your water bottle and your athletic tape, cause here we go! Now that the regular season has ended, some talk about the draft has begun and tends to include discussion about Heisman Trophy candidates. Well, the Tennessee Titans offense features not just Heisman candidates, but 2 of the past 4 Heisman winners – Derrick Henry and Marcus Mariota. Today, we will look at the 2014 winner – quarterback Marcus Mariota. Born in Honolulu, Hawai’i, he wasn’t a starter until his senior year. He went to University of Oregon where, after redshirting for a season, he was a 3 season starter, putting up very impressive passing and rushing numbers. He won a host of college football awards in 2014 and was the 2015 #2 overall pick in the NFL draft by the Tennessee Titans. 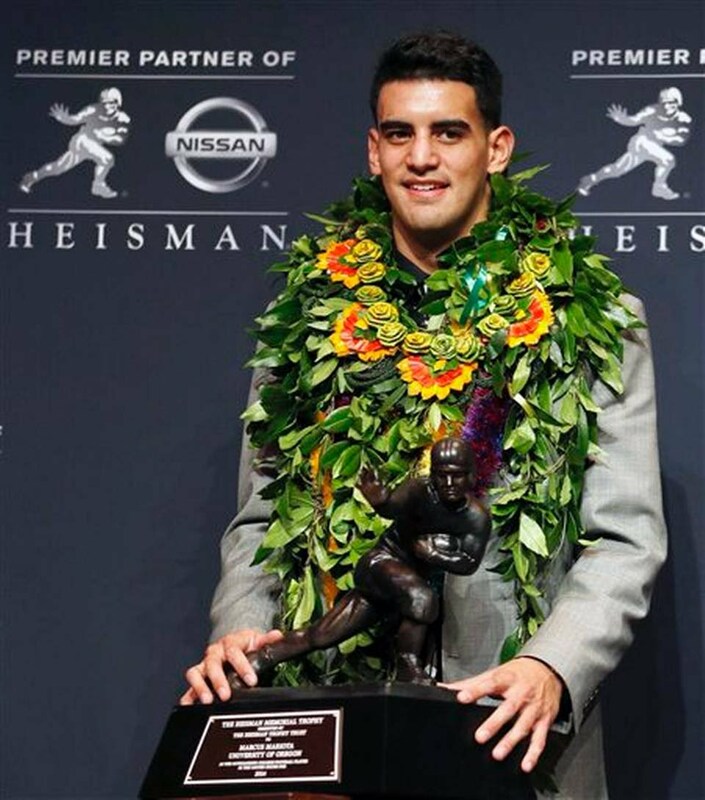 Mariota and his Heisman Trophy, one of 7 major awards he received after the 2014 season. Mariota just finished his third season with the Titans and while, statistically, it was his lowest TD total and highest interception total as a pro, the Titans finished 9-7 – their best record since 2011 and their first playoff birth since 2008. Today they travel to Kansas City to take on the Chiefs. 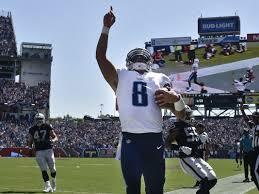 Mariota seeks to honor God through his life and through his play on the field. 1- What defines you? – In 2014, Mariota won the Heisman award , the Maxwell Award, the Archie Manning Award, the Walter Camp award, The Davey O’Brien Award, The Johnny Unitas Award, and 3 separate player of the year awards. He was the number 2 pick in the draft a few months into 2015. If anyone met the definition of football player, Mariota fits that bill. However, there is more to him than football. The same is true for all of us. We are not defined by the sum of the things that we do. Our life and purpose run deeper than our job and our list of accomplishments. Because honestly, if we are going to prop ourselves up on our list of things that we have done in our life, then we will also have to admit and recognize all the bad things we have done in our life. And that list is a lot longer than the good. But our life and purpose is not tied to what we have done, it is instead set for us by the One whose very words and hands created the universe and everything in it. God loves us so much that he made a way for our rebellion, selfishness and bad choices to be dealt with and forgiven. He then invites us to join Him on an adventure of serving others by serving Him and following His plan for us. So what is it that defines us? We are His! Mariota leads the Titans to their first playoff game since 2008. They play Kansas City later today. 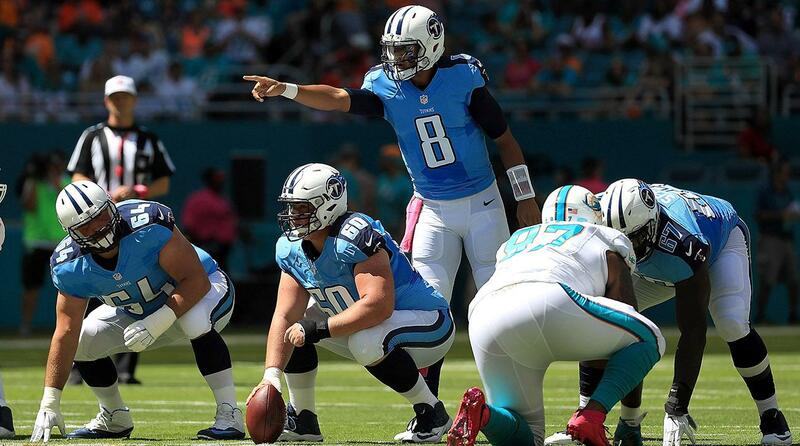 2- Teachable – Mariota is a student of the game. He works hard to be the best that he can be at all aspects of quarterbacking at the NFL level. In order for any football player to be successful and to improve his game, he must admit that there is still much to learn. Mariota speaks highly of his coaches throughout his career, even back as far as Pop Warner. He learns from them and applies what they teach him to game situations. Success comes from continued improvement and growth and learning from mistakes. 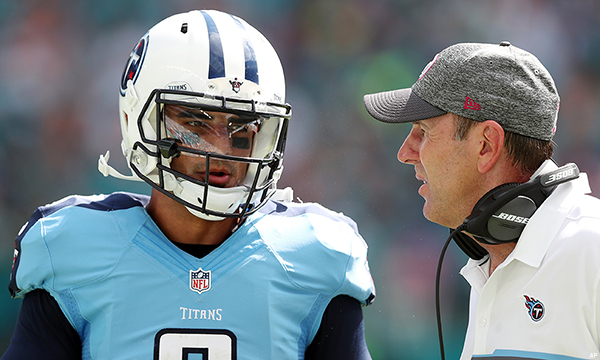 Mariota talks about lessons he has learned from his college coach, Scott Frost. He also talks about connecting with FCA staff and being helped on his spiritual journey by other people who have challenged him and guided him to owning his faith and making it top priority in his life. Who has helped you on your journey of faith? Have you experienced the importance of being teachable as you seek to live for Him? Are you growing in your faith, learning from your mistakes and seeking the help and wisdom of others who can mentor you? And lastly, are you prayerfully asking God to make you more teachable as the Holy Spirit guides you daily through life? The path is set for you. Trust God and let Him lead you to the best life possible.